In May 2008, Jon Trainer of Outer Level software came to me with a then confidential project — designing an icon and a UI screen for a top secret iPhone native application called Bullfrog Touch. I've worked with Jon for years — designing the Outer Level logo, and creating an icon for LicenseKeeper, so I was happy to help translate his popular Mac OS X app Bullfrog to the iPhone. The first challenge was creating a new logo for the Bullfrog Touch application. I needed to incorporate the existing Mac OS X Bullfrog cartoon icon, created by Jordan Langille and adapt it to the iPhone. With the bullfrog icon on the left I chose Arial Rounded Bold for the Bullfrog font, applying a bright green glow in Fireworks. In the open space to the top-right of the Bullfrog text, TOUCH fit perfectly. I stayed with Arial Rounded Bold in all caps, adding jumbled alignments to visually suggest a bullfrog's jumping action and for a bit of contrast. My goal was to make the scores screen clear, easy to read and use, while maintaining look and feel of the new logo into the UI design. Jon was happy with the results, using the mockup and exported files as a reference for the final application UI. The colors and button styles and some of the elements were changed, resized and tweaked, but are still pretty close to my mockup. Conclusion? That was fun, I want to do it again! It was an interesting and enjoyable challenge working with Jon on this iPhone UI design project. I look forward to helping others on future iPhone app projects to keep exploring this fascinating new UI design space. Jon Trainer has a post about the design process on his company blog. This is not to detriment your work (quite the opposite!) but I really prefer your mockup to the final :) Bigger buttons, more character. There also appears to be something you can do with the scores that isn't indicated on the final (or perhaps that feature didn't exist anyway). Peter, thanks for the feedback and kind words! They're appreciated and encouraging. I liked the darker look as well, but I don't know Jon's limitations and decisions completely, which effected the final design (e.g. the brown color, etc.). That's one of the reasons I'd like to be even more involved in UI design for an iPhone application sometime in the future. I would really enjoy collaborating with a developer on the many screens involved — making sure they're consistent, simple and compelling. Right now I've been very aware of learning the UI on the applications I use and test on the iPod Touch (that's one of the reasons I chose to buy the Touch in fact). As for the score icons you mention in my mockup but not in the final — Jon mentioned that the link icon is used in the final application, but only for actual high scores. 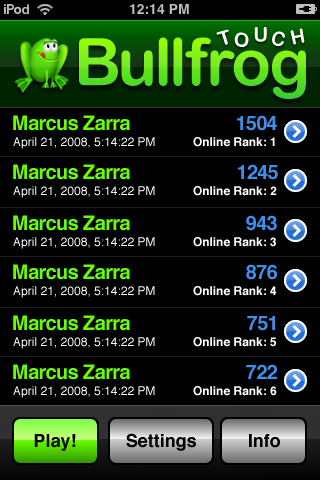 The scores in the image are the dummy scores from an early build, and therefore have no online equivalent to link to. An updated screenshot by Jon might not be a bad idea, now that there are actual high scores to show.